In Russian hands since 1710, the captured territories which formed Livonia were first merged into a single political entity in 1762 under the orders of Empress Catherine the Great. She was Russia's great empire-builder, concentrating her efforts on expanding the new empire's borders both southwards and westwards. Russian governors-general were appointed to administer the Baltic provinces, which included Courland, Estonia and Livonia (the Riga Governate). However, in a reversal of Catherine's own policy and during her lifetime, local governors were re-appointed and continued to administer the former divisions from 1783. In 1801-1809 and from 1819 onwards, under a very different Russian emperor, supreme authority was vested in a governor-general who was based in Riga, but at other times the provinces were governed independently. The governor-general was also the military governor of Riga until 1864 and then the commander of the military district of Riga until 1870. Governor-general of Livonia (from 1762) & Estonia (from 1775). With an increase of direct Russian control of the Baltic States in mind, Catherine the Great orders Livonia to be administered directly by the governor-general of the Baltic Provinces, Count George Browne. Estonia follows suit in 1775. Local governors are re-introduced to both Estonia and Livonia in 1783. Having secured the Swedish throne through force, Gustavus reintroduces an absolute monarchy, forcing parliament to accept a secondary role. Despite two failed military campaigns in 1788-1790, first to capture Norway and then to recapture the Baltic Provinces from Russia, he is still able to restore Sweden's military power and restore to the country some of its former sense of greatness. Between 9 September and 11 October the position of governor-general of Estonia and Livonia is vacant. The joint kingdoms of Poland-Lithuania are extinguished. Lithuania is submerged within imperial Russia. The following year, the Riga Governorate is renamed the governorate of Livonia. Between October and 9 November the position of governor-general of Estonia and Livonia is again vacant. The position of governor-general of Estonia and Livonia is expanded to include Courland. Between 29 June and 21 July the position of governor-general is vacant. Between 6 February and 27 March the position of governor-general is vacant. Estonia is removed from the responsibility of the governor-general. Napoleon invades the Russian empire with one of the largest armies French-dominated Europe has ever seen, occupying the Baltic provinces for several months and interrupting the governor-generalship between 24 October and 9 November. The governor of Courland flees to Riga and remains there for the period of French occupation. On 5 January, Estonia is once again included in the governor-general's responsibilities. The emancipation of the serfs in Livonia is something which is advantageous to the nobility, as it dispossesses the peasants of their land without compensation. The social structure changes dramatically, and a class of independent farmers establishes itself after reforms allow the peasants to repurchase their land. Between 29 March and 9 April the position of governor-general is vacant. Between 13 November and 14 December the position of governor-general is vacant. 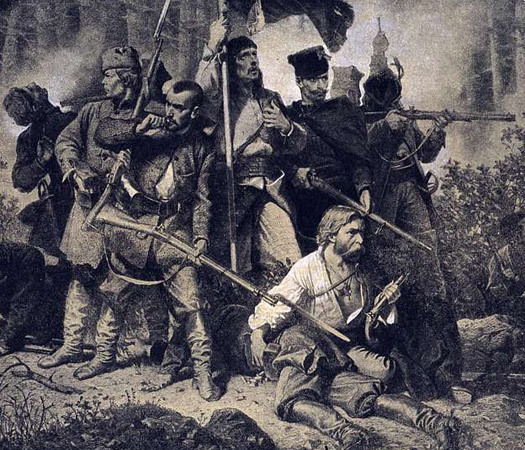 The January Uprising across much of the former Polish-Lithuanian Commonwealth includes Poland, Lithuania, the Baltic Provinces, Latgallia, and Livonia. It results in a policy of Russification throughout these regions after spreading from Latgallia to the rest of Livonia. Last military governor of Riga. First cmdr of Riga military district. Last commander of the Riga military district. Between these years, authority over the Baltic provinces is devolved to the provincial governors. Revolution in the Baltics in 1905 takes on a nationalist character, and in the same year the position of governor-general of Courland (from 23 August) and Livonia (from 11 December), but not Estonia, is revived on a temporary basis until 1909. Between these years, authority over the Baltic provinces is again devolved to the provincial governors. In 1914, the position of special plenipotentiary for civil administration of Livonia, Estonia and Courland is created. The first incumbent is given responsibility for Estonia and Livonia, but excluding the district of Riga in 1914, then Reval (Tallinn), Baltischport (Paldiski), and Dünamünde (Daugavgriva). Courland and the district of Riga. Acting special plenipotentiary, but name unknown. Commissioner, civil administration of Courland, Estonia, & Livonia. Thanks to Russian First World War defeats of 1916 and 1917, the Baltic provinces are conquered by Germany between 1915 (Courland) and 1918 (Estonia), much to the relief of the German-descended land-owning aristocracy. In 1917, Bolshevik-inspired thoughts of revolution are swiftly put down by the Germans and a semi-independent pro-German regime is established. The Baltic provinces are formally transferred to German authority by Russia in 1918 following the Treaties of Brest-Litovsk and of Berlin. This arrangement quickly falls apart and with a year Courland, Latgallia, and southern Livonia are independent as the republic of Latvia, while northern Livonia, Ösel, and North Estonia are pulled together as the republic of Estonia.